Cognitive Behaviour Therapy (CBT) helps adults, teens and couples overcome problems that affect our thinking, emotions, physical wellbeing, behaviour and relationships. CBT is effective for depression, anxiety, panic attacks, trauma, phobia, general anxiety disorder, obsessive compulsive disorder, stress problems, eating disorders, agoraphobia, social anxiety, anger, grief, low self-esteem, self harm, assertiveness, relationship and communication difficulties. CBT developed by Dr. Aaron T. Beck is a solution-focused approach to treatment, oriented toward solving problems and learning skills. The goal of CBT is to help people get better and stay better, and its effectiveness has been demonstrated in thousands of clinical trials. At the heart of cognitive behaviour therapy is the idea that how we see ourselves, others, and our situation gives rise to our current moods, emotions, symptoms and behaviour. Making small changes to our situation, soothing our physical and emotional symptoms and developing new habits of thought and behaviour can dramatically improve our lives. If you are feeling worried, low, angry or stressed and you think your life could be more enjoyable and rewarding read about how therapy helps common problems on the CBT Therapy page. Here you will find descriptions of common difficulties that are treated effectively with Cognitive Behaviour Therapy (CBT). You will also find some of the typical psychological, emotional, physical and behavioural symptoms for each of these common difficulties. This is not a formal diagnosis as we are all affected differently. 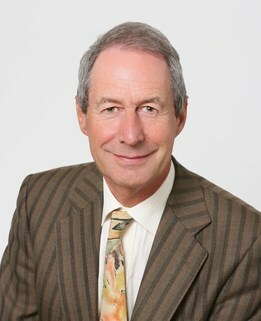 However you may recognise some of the typical symptoms in yourself or in a loved one. See Treatment Information for locations and Fees. Cognitive Therapy for Children and Teenagers ​makes use the Pesky gNATS game. "It was difficult at first, I soon understood why I felt the way I did and was able to use these techniques which made me feel better about myself." "I feel I have my life back and CBT has helped greatly and I cannot emphasise how much it can help!" "When I recognised I was feeling really bad because of the judgements I was making, I felt free. Then I stopped making things worse by acting as if my judgements were true." Depression is a common and growing experience which affects how we think, behave and feel emotionally and physically. One in ten people in Ireland experiences depression. We can experience depression for any number of reasons, including long term stress, or a negative life event. If this sounds like you Measure Your Mood below then visit the Self Help page or consult your GP or a CBT Therapist for support in feeling better and overcoming your problems. A CBT therapist will support you in creating and following a personalised evidence based treatment plan, between 9 and 20 sessions, depending on the severity of symptoms and pace of recovery. Together you will regularly measure and reflect on your progress and learn what works best for you to regain full health. ​Anxiety is a term used to describe distressing feelings of nervousness, worry, and apprehension. Anxiety can affect anyone, whatever their age, gender or situation. It affects how we think, behave and feel emotionally and physically, causing us to feel panicky and frightened and want to escape or avoid situations. If this sounds like you Measure Your Anxiety below then visit the Self Help page or consult your GP or a CBT Therapist for support in feeling better and overcoming your problems. Through a course of CBT you learn how to overcome anxiety using stress management, relaxation skills and overcome your feared situations. A CBT therapist will support you in following an evidence based treatment plan, between 9 and 20 sessions, depending on the severity of your symptoms and pace of recovery. Together you will measure and reflect on your progress regularly and learn what works best for you to regain full health. General Anxiety Disorder is characterised by feeling anxious about a wide range of situations, rather than one specific event. People with GAD feel anxious most days and may struggle to remember the last time they felt relaxed, often describing themselves as having been a 'worrier' all their life. Central to GAD is the way worry is used as an unhelpful strategy for anticipating, preparing for problems and avoiding emotions. Through a course of CBT you will break the cycle of worry and learn strategies to manage emotions and actual and potential worrisome situations. A CBT therapist will support you in following a specialised treatment plan, between 9 and 20 sessions, depending on the severity of symptoms and your pace of recovery. Together you will measure and reflect on your progress regularly and learn what works best for you to regain full health. 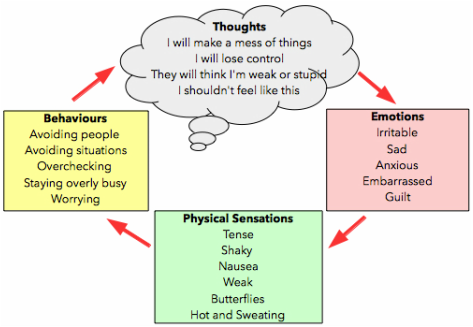 Typical thoughts, emotions, sensations and behaviours in GAD. Post-traumatic stress disorder (PTSD) can occur following an event that threatens or appears to threaten your safety. Typical symptoms of PTSD include experiencing upsetting flashbacks, and nightmares, as well as feelings of emotional distress and intense physical reactions when reminded of the upsetting event. As a result you may try to avoid activities, places or thoughts that remind you of the experience and be overly sensitive to sights, sounds, that startle you. If this sounds like you Take a Stress Test below then visit the Self Help page or consult your GP or a CBT Therapist for support in feeling better and overcoming your problems. A CBT therapist will support you in following a specialised, evidence based treatment plan, between 5 and 12 sessions, depending on severity of symptoms and your pace of recovery. Together you will regularly measure and reflect on your efforts and progress and decide what works best for you to regain full health. 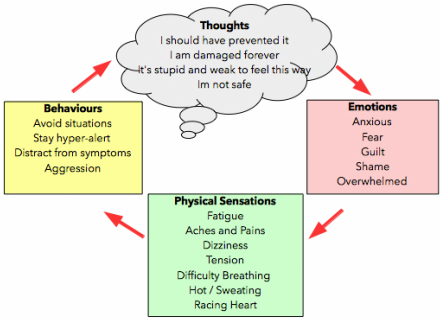 Typical thoughts, emotions, sensations and behaviours in PTSD. Obsessive compulsive disorder (OCD) is an anxiety disorder that affects 2% of the population at some point in their life. OCD is characterised by the presence of intrusive upsetting thoughts and the compulsion to prevent those thoughts coming true. If this sounds like you Take an OCD Test below then visit the Self Help page or consult your GP or a CBT Therapist for support in feeling better and overcoming your problems. Through a course of CBT you learn how to break the cycle of intrusive thoughts and compulsive behaviour. A CBT therapist will support you in following specialised, evidence based treatment plan depending on severity of your symptoms and pace of recovery. Together you will regularly measure and reflect on your efforts and progress and learn what works best for you to regain health. 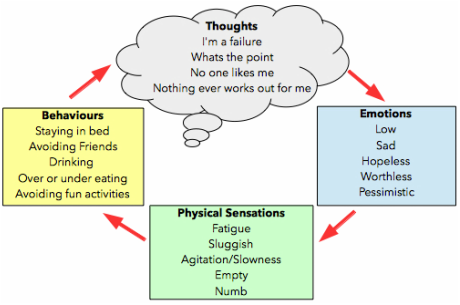 Typical thoughts, emotions, sensations and behaviours in OCD. Social anxiety or social phobia is a common anxiety problem affecting 5% of the population. It is a persistent, intense, and chronic fear of being watched and judged by others and of being embarrassed or humiliated by ones own actions. To prevent feelings of distress people avoid social situations where they feel they may be scrutinised. If this sounds like you Take an Anxiety Test below then visit the Self Help page or consult your GP or a CBT Therapist for support in feeling better and overcoming your problems. Through a course of CBT you learn how to manage distressing emotions, physical sensations and break the cycle of anxiety and avoidance. A CBT therapist will support you in following a treatment plan, between 9 and 16 sessions, depending on the severity of you symptoms and pace of recovery. Together you will measure and reflect on your efforts and progress regularly and learn what works best for you to regain full health. 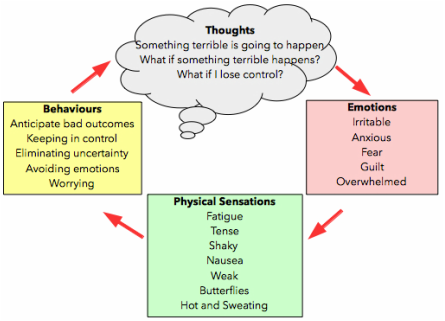 Typical thoughts, emotions, sensations and behaviours in Social Anxiety. CBT is provided in a number of locations according to clients therapeutic needs by trained, skilled and qualified therapists. In Dublin CBT is provided at Donnybrook, Blackrock, Swords and City Centre locations.